Cosy accommodation for 3 near Pacy-sur-Eure where you will find a beautiful castle and go for walks along the Eure river, not far from Paris. This town house is home to 2 cottages full of charm in the heart of a beautiful and lively town in the Valley of Eure. The attic occupies the 2nd floor. 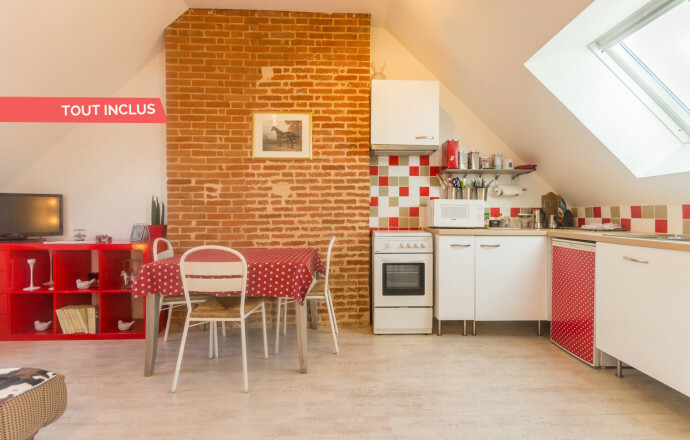 Attic, furnished with taste and a current decoration, this apartment offers you a real comfort. At the center of many tourist and natural sites (valleys of the Seine and Eure, Giverny...) and a varied leisure offer. Apartment located on the 2nd floor of a town house : entrance to the 1st floor via a staircase, living-room (click-clack), kitchen, lovely room with sloping ceilings and spacious area (2 beds 90x200 convertible into 1 double bed 180x100, 1 single bed), bathroom (walk-in shower open on the bedroom), toilet. Warm welcome. For your convenience, all charges are included (except end of stay cleaning of €30). Gite adjacent to a 2nd one (ref 889 for 2 pers.) and small restaurant by the owner on the ground floor (open for noon). Small courtyard enclosed by walls. Washing machine and dryer common to the 2 cottages. 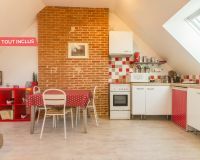 Bonne adresse a garder Excellent séjour, calme, super agréable pratique en centre ville Un gîte a recommandé autour de nous. Très agréable le gîte tendance en arrangement et couleur .que du bien à dire . Nous avions peur d'avoir trop chaud non bien isolé . accueil chaleureux. patio agréable où déjeuner en bonne compagnie. Je recommande pour son calme et son confort.Tout près des commerces.